What were the best selling products during the Great Depression? When the stock market crashed everything changed in America, wealthy people became poor and poor people were struck by how much lower the economy can throw them down. The harsh period lasted for almost a decade, and it was known as the Great Depression. You will be surprised by how much you can learn about this historic period just by the popular products people used during the time. We’ll try to do our best not to leave you depressed after reading the article so we have one trick up our sleeve you could try. For all our readers who get sad just by thinking of the Great Depression, we recommend you to read our list of 15 Best- Selling Baby Products of All Time. The hard times of the 1930s heavily influenced the cultural life in America. It was the time when people sought escapism in the movies, radio, novels, dramas, etc. because those moments provided people with a chance to forget about the depression. The impact of Hollywood during the Great Depression was of an important significance because the Hollywood and the movies offered comfort and consolation to the people of America. In order to make the list of best selling products during the Great Depression we did a lot of reading and a lot of investigation in our history books. The Great Depression was so severe that millions of people lost their jobs and with jobs people lost their homes. So it comes of no surprise that many shanty towns were made out of cardboard boxes and other items. These shanty towns made by homeless people were known as ‘Hooverville’, the name was inspired by the president of the time Herbert Hoover, who was widely blamed for the Great Depression. When Franklin Delano Roosevelt became president in 1933 he promised a ‘New Deal’ for Americans. The New Deal included a number of federal organizations with a purpose to get people back to work and improve the economic situation. When Roosevelt became president many shanty towns were destroyed, however, the struggle remained. You can find a lot about the Great Depression subtly hidden in literature, for example, Langston Hughes wrote a lot about the ‘numbers game’ which was in a way an illegal lottery that was played a lot in Harlem and other poor neighborhoods in America during the period. People would invest every penny in the numbers game just for the hope of gaining something. 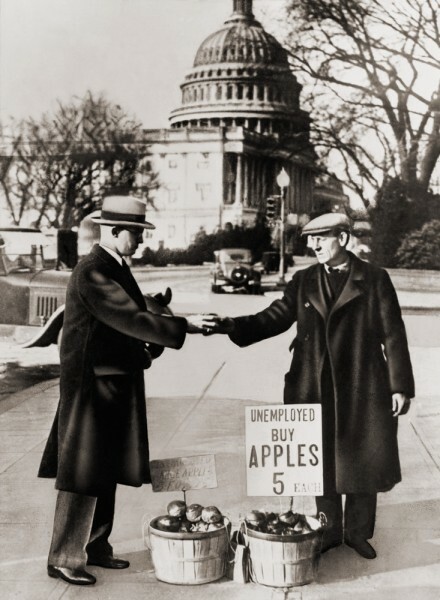 Hope was an important ingredient for Americans during the Great Depression, as due to the job recession during the Depression, people needed every bit of hope so they could live another day without pessimism.